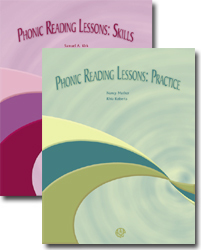 Phonic Reading Lessons was extensively revised by Nancy Mather and Rhia Roberts, and published in 2006 by High Noon Books. The original in 1938 was a groundbreaking work by education pioneers Samuel and Winifred Kirk and Thorleif Hegge, later revised by the Kirks and Esther Minskoff. Try these sample lessons - click on the image below and print them out! PRL Skills: 8-1/2x11 spiral-bound softcover, 136 pp. and PRL Practice: 8-1/2x11 spiral-bound softcover, 112 pp.